Super Cupid Shooter is another Valentine themed point and click game from bored. 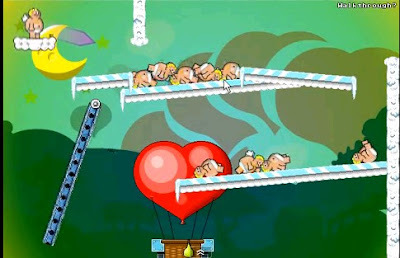 The gameplay is similar to the popular Ragdoll Cannon game where you shoot the dummy and make him touch the goal target and in this one its a hot air balloon. You need to get the fat Cupid to his hot air balloon in each level. There are 36 levels in the game and 4 bonus levels. The game can be won through a lot of trial and error techniques but if you are feeling lazy to go all through that, here is the complete SCSw Super Cupid Shooter walkthrough showing the solution to all of its levels.